Forget the Red Bull, coffee, even the euphemistically described “stronger substances”. 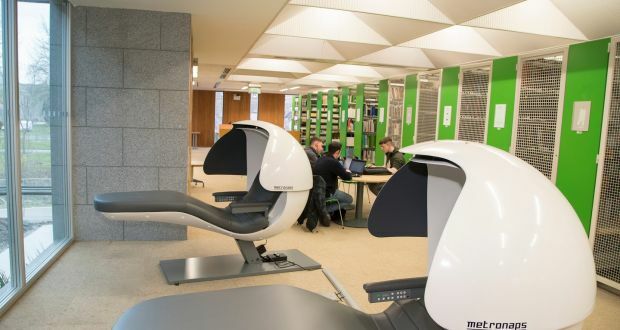 If you are a student at Maynooth University they have new ways of giving you wings: napping pods – three, in fact. It is the first Irish university to install high-tech EnergyPods which will allow students take 20-minute naps to maintain energy levels while studying. Designed for high-pressure business environments, they are being leased by the university from MetroNaps UK. They feature a privacy visor and built-in speaker system to block out surrounding distractions and have a timer to allow for a 20-minute snooze before waking to an alarm. Two EnergyPods have been installed at the university library and one at the its access office. It is all the result of the University’s 2017 Library Innovation Award and a #IfStudentsDidLibraries campaign. Approximately 40 students submitted proposals on how to improve Maynooth University Library. A shortlist of seven finalists was selected and these pitched their innovations to a panel of judges, who chose the winner. That was first-year student Brian Crinion, studying for a BSc in Robotics and Intelligent Devices. He received the €1,000 prize. His own hectic schedule of classes, extracurricular activities (unspecified) and the long commute from his home in Slane, Co Meath, inspired the idea as he tried to find ways to recharge during the day. Making his pitch to the judging panel, he outlined the proven benefits of napping, quoting research which showed that a 20-minute nap is more effective than a cup of coffee in restoring energy levels and without the associated crash, as is the case with sugar or caffeine. He “looked at the benefits of short napping during the day and researched ways of fitting them in to student life. The EnergyPods were the perfect solution,” he said. The judging panel included University Head of Academic Services Lorna Dodd, University librarian Cathal McCauley, Dean of Teaching & Learning Dr Alison Hood and director of the National Library of Ireland Sandra Collins.